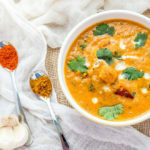 Paneer Butter Masala is a popular paneer dish, in fact one of the most popular vegetarian dishes in Indian restaurants. 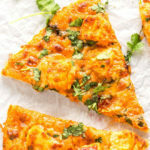 The dish is also popularly known as Paneer Makhani and has a tomato based gravy, even though I added onions in this recipe. This gravy is super rich because of the generous use of butter and cashew nut paste. I have come across lots and lots of paneer butter masala recipe but trust me this is absolutely the best Paneer Makhani recipe that you would ever get. I have made this a number of times and it has always been a huge hit. 1. Roughly chop the onions and tomatoes. Put 1 tsp oil in a pan and dump all the onions and tomatoes into it. Now add the cashews. Let this cook for 7-10 mins or till the onions become soft and tomatoes become mushy. The cashews would also become soft by then. Now switch off the flame and wait for the mixture to cool down a bit. Grind to a smooth paste. 2. Take 2 tbsp butter in a pan. Also add a tsp of oil into it, this will prevent the butter from burning. Add ginger-garlic paste and saute for 2-3 minutes. Now strain the onion-tomato-cashew paste and add it to the pain. The straining helps in getting a smooth gravy. 3. Add in the paprika powder, cardamom powder, garam masala, red chilli powder, salt and sugar and give it a good mix. Now crush the kasoori methi and add it to the gravy. Add the cream into the gravy next. 4. 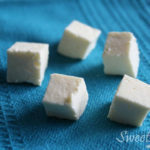 Cut paneer into desired shape and add to the gravy. At this stage you can add either milk or water to the gravy. Milk will further increase the richness of the dish. 5. Cover the paneer and let it simmer for 5-7 minutes on low heat. This is to make sure that the paneer absorbs all the spices well. Sprinkle garam masala on top and garnish with chopped coriander. 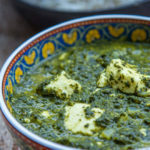 Serve Paneer Makhani with butter naan or rice. 1. Use of onions is optional. This gravy is traditionally made only with tomatoes. 2. Skip using the cream if you want to cut down on the calories. Use milk instead. 3. The gravy can also be made using almond paste. 4. The gravy gets really thick after it cools down [because of cashews] so adjust the consistency accordingly. Thank you so much Mousam for your feedback & support! 🙂 I’m glad it turned out well! But your recipe description and presentation is appreciable. All the best.